After having completed two relatively simple to moderate treks in Sandakphu-Phalut and Kuari pass, as a natural progression I wanted to try something serious. 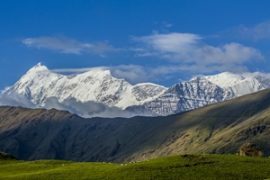 Saptarshi (Sapta) of Himalaya Trekkers suggested that Goecha La is suitable for me and a trek which commands some of the stunning views of Kanchendzongha and its neighbouring peaks. As per plan I started from Kolkata by overnight train and reached NJP on morning of 25th April’ 2013 . At NJP our car was already waiting for us. All the team members of Himalaya Trekkers gathered just outside the railway station and soon we were on our way to Yuksom around 10 in the morning. The first 30 km of this drive was through the plains of Bengal up to Himalayan foot hills. The views soon after the foot hills are lovely as one sees the curvy views of Teesta River flowing between the hills. The drive took us through the towns of Joerethang and Legship. The journey of 6 hours takes one through typical Himalayan roads with beautiful Rangit River accompanying you. We stopped for lunch at a place called Malli. Finally we reached Yuksom at around 6 in the evening. Yuksom at 5500 ft is an ancient town in the in Geyzing subdivision of West Sikkim. 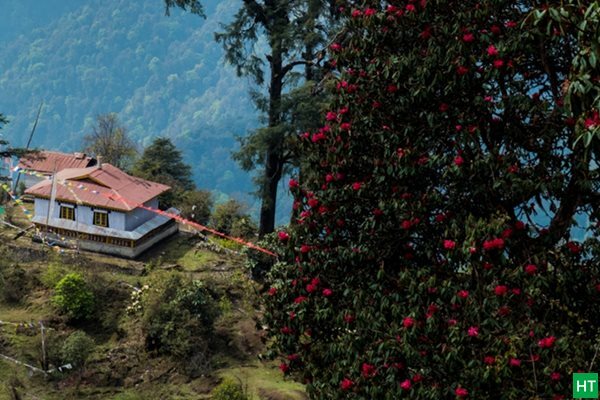 It is the starting point for the trek to Goecha la and is an ideal place for one who wants to avoid the bustle of Gangtok and Darjeeling. It was the first capital of Sikkim established in 1642 AD by Phuntsog Namgyal who was the first Chogyal (temporal and religious king) of Sikkim. The coronation site of the first monarch of Sikkim is known as the “Throne of Norbugang”. At yuksom we were greeted by Sher Bahadur who had already made all arrangements for the ration of the trek and also had arranged for porters and Yaks. We checked into hotel Dzongrila. The evening passed while chitchatting with other team members and sharing our experiences. We ordered Chicken meals for dinner at Gupta Restaurant around 8 pm. After returning to the lodge all of us did some last minute packing and finally went inside the comfort of bed and blankets around 10 pm. In the morning from the window of the hotel we had a fantastic view of the snow covered peaks of Kabru – North and South. This lifted our spirits and soon I and Anutosh were on our way to the coronation site which I planned last evening. It was a 15 minute walk from the market place where we had put up for the night. It is an ancient archaeological site and a monument of national importance.There is also a beautiful monastery and the calm and serene atmosphere is sure to ignite the spiritual senses in anyone who makes a visit there. Refreshed we returned to our lodge and were handed over the permit forms. At Yuksum there are two important things to complete before you start for the trek – One, making an entry at the police station. 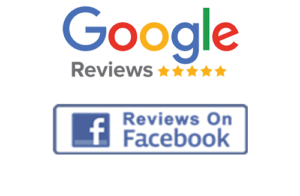 For this you need a photo identity proof with three photo copies. Two, you need to pay the permit fees at the forest check post. We had our breakfast with porridge, fruits, roti, vegetables and finished it with a round of coffee. The porters were ready with our guide Sher Bahadur would accompany us for the entire trek. We handed over the rucksacks identified for the porters and soon I was on to my third trek in the Himalayas. Most trekkers would trek from Yuksum to Tsokha in a day. 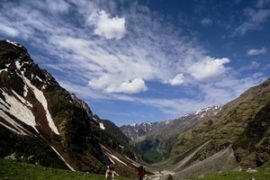 At the very first day of the trek it is tiresome as your body is yet to be acclimatized and also it involves in an abrupt gain in altitude. So it is advisable to break the trail at Sachen. 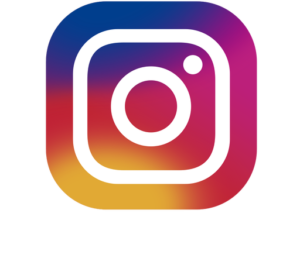 Lucky for us Himalaya Trekkers already had it in mind. The trail from Yuksum passes through the check post and the village huts and soon starts to climb gently. There were many groups and also an equal number of Dzo (a cross between Yak and Cow) carrying loads of logistics. After around 40 minutes the trail gradually enters the forest and after a small climb and gradual descend one arrives at the first bridge over Pha Khola (Khola is the Nepalese word for a River). The trail then enters Kanchendzonga National Park with a wide gate welcoming trekkers and after a further trek of an hour one arrives at the second bridge over Tshushay Khola. The trail continues through thick forest and after another hour’s trek one arrives at the third bridge over Mentogang Khola. From this bridge the trail goes uphill for 25 minutes and then gradually flattens out. Look for a clearing to your right in the forest. You have arrived at Sachen the campsite for the day. Sachen is an ideal camping ground for those who love to spend the night amidst thick forest. It is a small clearing in the forest having space enough to pitch 6-8 tents. When we arrived the porters and sapta were busy pitching tents. I took off my rucksack to assist them. There is a small shelter with two rooms to cook. One such room was to be used as our kitchen. Soon lunch was ready with hot Yai Yai. After the days exhaustion the noodles was a delight. Prek Chu River flows below Sachen and you can hear its faint sound from the campsite. The campsite provides a good opportunity for spotting birds. If you are a birding enthusiast the trail is not going to disappoint you. We woke up to a bright sunny morning and soon started to get ready for the day’s trek to Tsokha. After having a mixed breakfast with porridge, bread, jam and peanut butter we started for the second day’s trek to Tsokha. Tsokha is a Tibetan settlement about 10 kms from Sachen. The trail passes through the oak forest with occasional ups and downs and after about 45 minutes we reached a shelter meant for rest. Just ahead of each of the bridges you will find shelters like this. From here the trail goes steeply down to the bed of Prek Chu and after taking the final turn the beautiful hanging bridge over the river comes into full view. This is the longest of the four bridges. The bridge is adorned with colorful prayer flags signaling success to the expedition. It sways on both sides when you walk over it. The roaring Prek Chu flows underneath with all its might. It is a treat to walk over the bridge. You do not meet the river until three days later at Kokchurong. From here begins the first real climb of the Goecha La trail – subsequent climbs that will stay with you until you reach Goecha La. Take the trail that goes to the left and up the ridge in a series of switchbacks and after an hour and half a few huts and a resting place signals the arrival of Bakhim. Bakhim has resting place and a tea shop where one can get tasty momos too. But they do not prepare in advance so, you need to wait after you order. After the steep hike from the fourth bridge a cup of coffee is worth savoring at Bakhim. From here Tsokha is a 40 minute steep uphill hike. Bakhim has a few huts and a forest rest house where you can spend the night. It has splendid views of the Yuksum valley. On our onward journey we were not as lucky since the entire valley was covered under a thick blanket of fog. But on our return to Yuksum at end of the trek the valley opened up, thanks to a better weather. Follow the trail that goes along the tea shop and besides the forest rest house. The earthquake of 2011 had cut deep cracks in the walls of the forest rest house and other huts nearby. The trail gradually rises up and soon rhododendron trees come to view. If you are making this trek in the blooming season (mid April to mid May) then you will be greeted with the first views of Himalayan rhododendrons. There are many short cuts bypassing the main trail which will cut the distance but will be a test of your quadriceps. Me and Sapta decided to try a shortcut to Tsokha while others stayed on the main trail with the guide. There were numerous rhododendron trees with flowers varying from red to yellow and white. As the shortcut is seldom used by trekkers this stretch of the trail had a special beauty due to its virginity. Meanwhile the weather was turning bad and visibility started to diminish. A light drizzle forced us to increase our pace on the steep slope. We were lucky as it did not turn out to be a full downpour. After 30 minutes steep hike the railings of the Tsokha trekkers hut came into view. We were the first in our group to reach Tsokha and took shelter in the trekker’s hut. The cook and his team had already arrived and were busy preparing lunch. The rest of the folks in our party with Sher Bahdur reached in 30 minutes exhausted. On arriving at the trekkers hut we were handed over a refreshing cup of tea. If you want to camp at Tsokha then look for the flat clearing beside the trekkers hut. This trek is a paradise for birding enthusiasts and Sapta brought to my notice a pair of Yellow Billed Blue Magpie from the camping ground of Tsokha. Tsokha is chilly compared to Sachen and if you are at Tsokha you may want to taste Chhang, a local beer made from fermented millet seeds available on the way to the monastery. The fermented seeds are served in a hollow bamboo shell called Tomba, and hot water is added very gradually keeping the seeds undisturbed (which requires a practiced hand) to make the drink. It is a local delicacy and very popular among the trekkers including foreigners. The Tsokha monastery was not far and I decided to pay a visit to the monastery in the remoteness of Himalayas. It was late afternoon and very misty. The monastery remains closed but you can ask for the keys in the shops down below. We had dinner by 8 PM and soon crashed into the comfort of sleeping bags. Today is going to be a long day for us. Every day during dinner Sher Bahadur used to brief us on the next day’s plan. Accordingly we were served breakfast by 7:30 consisting of pancakes, jam, peanut butter and porridge. Soon we were handed over packed lunch of bread, hard boiled eggs, boiled potato and choco pie. It is advisable to carry enough water for this day as there are no reliable water sources on the trail to Dzongri. From the camping ground we had splendid views of Mt Pandim, Tenzing Khang and Juponu. The trail to Dzongri passes the monastery and begins to climb the ridge above the village. From here Tsokha village looks like a landscape painted on a canvas. After about 30 minutes the trail enters the forests of Oak and rhododendron and is paved over wooden logs. This is one of the most rewarding days of the trek as it will take you through some of the densest rhododendron forests of India. If you are in the blooming season the entire slope is colored in red, yellow, pink and white. The trail can be muddy at places and after a spell of rain you need to watch your footsteps. It is a ridge climb and so the trail switches between the opposite sides of the ridge. There were a group of people returning from their BMC training at Chowrikhang, the base camp of Himalayan Mountaineering Institute. Many trekkers would go only up to Dzongri and not to Goecha La. So this stretch of the trail remains busy especially during peak season. After a continuous uphill hike of 3 hours the trail levels to an open ground on top of the ridge. You are now in Phedang at 12000 feet. At Phedang there is a small log cabin that serves as a kitchen where trekkers normally make a halt for lunch. Soon we unpacked our rucksacks and sat down for lunch and some much needed rest. Phedang being on top of a ridge is very windy. On a clear day you can get spectacular views of Kanchendzonga and its associated peaks from Phedang. From here one trail leads to Dzongri via Deorali top and another leads to Kokchurong. Many also prefer to camp at Phedang but since there are no trekkers huts available you need to be prepared with all camping necessisities. Water is available on the trail that leads to Kokchurong. From Phedang Deorali top is again an uphill hike of 1200 feet. I did not want to halt for long here as the weather turned from bad to worse and fearing a downpour we put on our raincoats. Dzongri was still 3 hours away. After a break of 20 minutes we took the trail that leads towards Deorali top. There were numerous rhododendron trees on both sides of the trail. Today indeed the walk was in God’s own garden! Deorali is a continuous uphill trek and trekkers now begin to feel the effects of altitude. After a continuous ridge climb of an hour and half a small chorten and prayer flags signal the arrival of Deorali top. From here on a clear day the views of Kanchendzonga and Pandim are simply out of this world. The rhododendron trees now change to rhododendron bushes. Occasionally you can spot patches of snow on the trail. It is very windy especially on Deorali top. From here the trail follows a series of gentle ups and downs and after an hour Dzongri trekkers hut comes into view as a tiny spec on the vast mountain slope. From here it is another half an hour to the trekker’s hut of Dzongri. We arrived at Dzongri by 4:00 and stayed at Dzongri trekker’s hut. The trekkers hut is large enough to accommodate 5-6 teams. On our arrival and after a cup of tea we were served with Yai Yai and pakoras by the caring team of Sher Bahadur. A clear stream runs in front of the trekker’s hut. If you want to camp at Dzongri look for the open space on the other side of the stream. There is enough space to pitch 6-8 tents. At night we had Garlic soup followed by spicy Indian style dinner. Soon went inside the comfort of sleeping bags. Dzongri top is a ridge above the campsite of Dzongri and which offers a panoramic view of the Kanchendzonga range. We did not want to miss on the sunrise and by 4:00 in the early morning we started off for Dzongri top. Follow the trail that goes from the front of the trekkers hut. It is cold and windy so you need to be in heavy woolens though once on the steep trail your body will begin to sweat. Also a torch (preferably head torch) is very handy. It is a steep climb to the top of the ridge and takes not less than 45 minutes. The ridge top is marked by a small chorten and prayer flags. We did a small puja here. Soon the peaks began to unfurl in front of us. It was not a clear day and the sky was foggy. But we had a good view of Kanchendzonga, Kabru and Pandim peaks. Looking in front and slightly to the right is Pandim and Kabru is to the left with Black Kabur blocking some parts of Kabru form your view. Right in front stands Kanchendzonga with its south east ridge dominating the skyline. You can spot Thansing in the distance below Pandim as a green patch which is going to be the destination for the day. From the top the meadows of Dzongri comes into view crossed by serpentine trails. The slopes are lined with bushes of juniper extending for miles which turned orange with the rays of sun and with the peaks in the background it was an experience to remember. After spending about 30 minutes we headed for the trail back to the trekkers hut. Thansing valley at the base of Mt Pandim is about the same height as Dzongri but trekkers need to descend almost 1000 feet to the bed of Prek Chu at Kokchurong. The trail to Kokchurong goes through the right of the trekkers hut (not to be confused with the trail to Dzongri top) and soon begins to climb above the ridge. After a steep hike of 30 minutes one reaches the top of the ridge from where the trail turns left on flat ground. 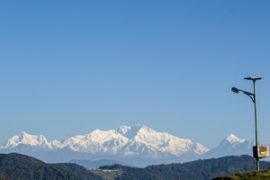 On a clear day you can see the peaks of Kanchendzonga and Pandim towering over the horizon. Yaks grazing on the meadows is also a common sight. The trail through the meadows continues for almost two hours. The slopes are only lined with dwarf rhododendrons and bushes of juniper. There are no trees to be seen on the trail. There otherwise gentle trail has a few up hill and downhill curves. 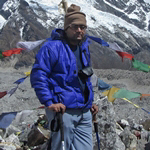 Also you can get the company of other trekkers and guides and enjoy the views. After sometime notice the trail going downhill. This is a descend to the bed of Prek Chu which continues till you reach Kokchurong. However Sikkim was again back with its usual foggy and mystic weather. Every day after 10:00 the clouds begin to flow in any by noon everything goes under a cloud cover. But now drops of rain also started and I hurriedly packed my cameras inside rucksack and put on raincoat. The descend to Kokchurong is gentile in the beginning but becomes steep on muddy trail. You need to skirt around the muddy patch. After a while the trail is over rocks. You can hear the sound of the flowing river which increases as you descend further down towards the river. After an hour look for the trekkers hut to your left. You have reached Kokchurong. Spot the trail which comes from right hand side and joins. It is the trail to Phedang which we would take on our return path. The river flows with a roar below the trekkers hut. The trail crosses the small wooden bridge to cross a side stream and goes to the true left of Prek Chu. Experience the cool breeze blowing over the bridge. It could be misty and with the gust of water flowing below and is a fairy tale experience. The water of the river is worth savoring. We cross another wooden bridge, this time crossing the main river and begin to climb gradually keeping the river to the left. Soon the path moves up and Prek looks like a small stream hundreds of feet below and finally goes off from sighting. The path is lined with trees and there are rocks on the trail. It is 2 Km to the meadow of Thansing but actually feels a lot longer.We crossed another stream over a narrow wooden plank. The climb ends at the top of the ridge and flattens out. The trees now reduce to bushes of rhododendron and juniper. The flat ridge top ends at the vast meadow of Thansing. Spot the lone trekkers hut at the start of the valley. There is also a small shelter besides the trekkers hut used as a kitchen. The hut has 4 rooms and a dining area too. Thansing is a vast valley at the base of Mt Pandim and Tenzing Khang. There is abundant space to pitch any number of tents here. Prek Chu flows gently through the extreme left of the valley. There are a few narrow streams that flow across the valley to meet the Prek. On a clear day you will have great views of Mt Pandim right in front shinning like a pearl. 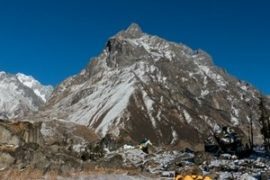 To the right of the trekkers hut where the valley ends stands Tenzing Khang, Jopunu and Narsing which are right to Pandim by a continuous ridge. In the horizon the south east face of Kanchendzonga can be seen as a formidable wall of ice shinning brilliantly. Lamuney campsite is at the other end of the Thansing valley and the lovely walk from Thansing is indeed a walk in paradise for, with each step you get closer to Mt Pandim and Kanchendzonga opens up towering above the horizon. This is the easiest day of the entire trek and even a delayed start is enough to reach Lamuney by noon. We had breakfast in the bright morning sun sitting on the rocks in front of the trekkers hut and enjoying the views of the snow covered peaks. 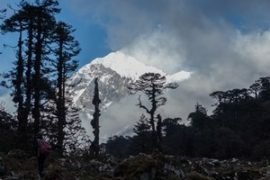 The trail from Thansing gradually rises which most trekkers will not feel after the stiff climbs of previous trek days. Occasionally there are a few streams that you need to cross over rocks. In the horizon the glacial moraine walls become visible and above which Kanchendzonga can be seen looming over. Lamuney is pretty windy. Earlier trekkers used to camp at Samiti lake above Lamuney but now camping at Samity is no longer allowed. It is a sacred lake at the foot of sacred Mt Pandim. Also there is an increased threat to the lake from pollution. In Lamuney there is a shelter used by the cook and porters as a kitchen. Prek Chu flows gently behind the kitchen of Lamuney. For trekkers camping is a must here. After lunch we went for a short acclimatizing walk. The vast valley was only lined with dwarf bushes of juniper. We saw a group coming down after a successful ascent of Mt Tenzing Khang. Lamuney serves as a base camp for those aspiring to climbing this peak. Today dinner was served at 7:00 in the evening as the next day we will have to start by 2:30 in the morning for Goecha La. So a good sleep was an absolute must. Sher Bahadur briefed us on the next day’s schedule. We were to be split into two groups and each group will be assisted by porters. It was planned that all porters will accompany us in case anyone plans to turn back or slows down in pace. We were to be served tea at 1:30 am morning! I was up by 1:30 am and started making some last minute arrangements. I could hear trekkers speaking in tents nearby. Sher Bahadur served tea and a packet of biscuit in our tent by 1:40. I woke up Anutosh and Udayandu and asked them to get ready. The remaining members in the other tent were also getting ready. We assembled by 2:10 and in another 10 minutes we were off to our destination for the day under the lights of head torches. It was pitch dark all around and Sher Bahadur was leading the way. The porters were also along with us. Only the illuminated portion of the trail was visible but I felt it was ok and safe enough. The trail initially passes over almost flat ground through the bushes of juniper. After about 20 minutes the almost flat trail began to rise gradually. At night on the trail the experience of a guide comes handy as you can get diverted to a different direction since nothing can be seen. I turned back after sometime to see 3 illuminated dots approaching us. They were some members from our party. The trail after a gradual ascent begins to climb steeply. At this point we waited for the entire team to assemble together. You need to carefully watch your steps on the rocks. There is no mud on the trail as it is mostly rocky. After a steep hike of 30 minutes you can hear the sounds of water flowing by. It is the stream flowing out of Samity Lake and going down to merge with Prek. Now the trail levels on flat ground and you notice a sandy bed with usual cracks and sound of water. Here on to your left is actually Samity Lake and the trail goes in an arc around the lake and to the other side and begins to climb steeply over the ridge. The lake remains invisible at the cover of the night. It was a long and continuous ridge climb and now at over 14500 feet trekkers begin to feel the effects of altitude. We took occasional breaks on the steep slope only to gain a breath. In spite of the sub zero conditions trekkers begin to sweat on this steep slope. On to your right is the wall of Pandim. It took us nearly an hour to reach to the top of the ridge from where the trail takes a turn to the right and begins to move up. Now we could see lights in the sky signaling the approach of dawn. The trail becomes narrow and moves further up to the 1st view point of Goecha La. View point 1 is almost at a height of 15000 feet. The weather was cloudy and we were disappointed. There is a small chorten where we did offered puja and waiting for the blessings of the weather God. On the left side of view point 1 the junction of the two Kabru glaciers is distinctly visible along with the moraine ridges. The sandy bed of Zemathang is also visible as a small patch ahead. We had choco pie and biscuits to refresh ourselves and began to move towards Zemathang. The trail to Zemathang is initially over rocks and boulders and further ahead you need to climb down the moraine ridge over a narrow zig zag path. It is a near 40 degree descends and could be tricky as the path is lined with scree and very slippery. The trail from here moves over the boulders and in another 30 minutes one reaches the sand bed. Mount Pandim stands tall on the right. There is a magnificent ice fall running down the top of Pandim and ending a little higher of Zemathang. With the sky now showing signs of improvement we started to climb the moraine ridge above Zemathang to have a better view of the peaks. This was a very steep climb with a gradient around 40 degrees. On the other side the ridge dropped vertically down to the bed of the glacier. We were advised not to step on the top as the narrow ridgeline can break and chance of a fall. Gradually the cloud cover lifted off and we could see the whole range of peaks from base to summit shining in the morning sun like glittering silver. We descended to the floor of Zeemathang and moved further. The sandy bed is about a kilometer in length. At the end the trail takes a turn to the right and begins to climb up the moraine ridge steeply in an arc at end of which lies View Point 2 and Goecha Lake.With our hearts contained in this magnificent surrounding we decided not to go any further but return. We had our breakfast with bread, jam, boiled potato, with eggs and headed back. While returning through view point 1, this time with the clear sky we had a very close up view of Mt Pandim, Kabru range, Rathong and others. We followed the same trail back and after crossing the last ridge Samity lake came into view. Samity is a beautiful emerald green lake above Lamuney and on a clear day one can see the reflection of Mt Pandim in its water. We returned back to Lamuney and took a break of an hour for lunch. Now we were on our return path to Kokchurong via Thansing. Finally we took shelter in the trekker’s hut of Kokchurong by 4:00 in the evening. There are options for camping in Kokchurong and if you want to camp look for the clearing besides the river below the trekkers hut. With the sound of the river flowing by camping at Kokchurong can be a memorable experience. The trail from Kokchurong to Phedang traverses through the side of a ridge and through dense forest of rhododendron. It is a narrow trail and takes 3 hours to reach Phedang which is almost at the same height as Kokchurong. Pandim was looking beautiful above the trekker’s hut of Kokchurong. The trail is almost flat over level ground. You do not find any Dzo on this stretch as they cannot negotiate the narrow trail through the forest. The trail can have occasional patches of snow and you need to be careful when stepping on them or better still skirt around them. About a kilometer and a half before Phedang the trail is paved over wooden logs. The trail ends on top of the ridge at Phedang. Note the trail to Dzongri that was taken up few days back. We took shelter in the Kitchen area where our porters were busy preparing lunch. Soon others in our team arrived. After having lunch of puri and subzi and having some rest we took the trail that goes down to Tsokha. This is the well known trail that was taken by us on our way up. We reached Tsokha by 3:00 in the afternoon. Around 4 it started to pour heavily and stayed around half an hour with hails. In the evening we sat in the dining room and rejuvenated our fresh memories while we all were happy to get the mobile network and spoke with the near and dear ones. Dinner served around 9 pm. This day was the last day of our trek. After spending over a week in the Himalayas and having the company and warmth of simple mountain people we would be ending our trek at Yuksum. In the morning before I went to the camping ground of Tsokha trekker’s hut to have a last minute view of Mt Pandim and it was looking awesome. The sky was absolutely clear and shining Pandim was in front of us. The descending trail is much easier than the ascending. We reached Bakhim in 30 minutes and had some tea at the stall. We then went downhill and crossed the bridge over Prek Chu and made a halt at Sachen for lunch with hot puri and sabzi. After lunch it was all the way to Yuksum. We reached at Yuksum by 5:00 in the evening. The next day we bid farewell to the Himalayas and drove back to NJP with a promise to return. I know that soon I will get into the coding and decoding of software but the memories I will cherish forever.